Lillian McCahan was the Ohiopyle Western Maryland Railroad Agent during World War II. She had already written several books including This Little Town, in 1940. It chronicled Ohiopyle life and happenings for one year. During the war she wrote a column, Our Soldiers, in the local publication, The Messenger. Through her column, she kept local soldiers up to date on where each of them were and what was happening to them. Each month, for almost four years, she mailed them to the men all over the world. Oftentimes, she published the letters they sent to her. From September 1946 through September 1947, McCahan wrote the book, That Little Town, sharing what was happening with the soldiers who were “lucky” enough to return home. This book was never published, but the original manuscript was donated to author Marci Lynn McGuinness, along with 100 of the soldier's letters. 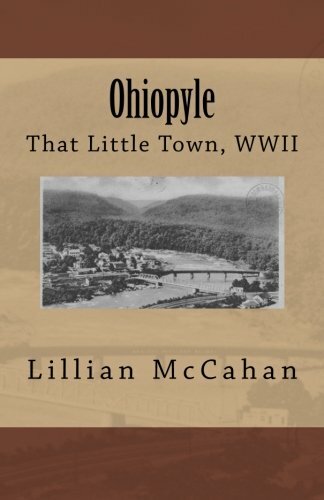 The new book, Ohiopyle, That Little Town, WWII, combines McCahan's manuscript and columns with the soldier's letters. From Pearl Harbor to the last soldier home, McCahan takes you back to a time when hundreds of people lived in the borough, and 150 local young men were away at war. In 1948, McCahan went on to prompt the preservation of Ohiopyle's Ferncliff Peninsula and scenic riverside mountains. Lillian McCahan starts her recently published autobiography, By the Side of the Road, saying, “I was born in a railroad station.” McCahan was a woman before her time, single, working a “man's job” at a railroad station, supporting her family, writing columns and books, keeping mountain area WWII soldiers in touch with each other, and forcing the issue of Ohiopyle's preservation. McCahan was a strong, lively lady. Her work entertains, informs, and preserves, living on. McCahan passed away in 1979, but her energy prevails.